In first decad – AzhwAr after experiencing thirumalai’s relishable nature in this manner [as in the previous decad], he experiences the unlimited auspicious qualities such as saundharyam (beauty) etc., of azhagar emperumAn and becomes delighted. emperumAn who resembles a kalpaka tharu (wish-fulfilling tree) on top of the thirumalai as mentioned in periya thirumozhi 7.10.3 “vadamAmalai uchchi” (the top of the great northern mountain) is beyond the glorification of vaidhika purushas (those who pursue vEdham), brahmA, rudhran, et al but is fully under the control of his devotees. when your great motherly forbearance towards your devotees is greater than your supremacy with which you can protect the devotees just by your divine will. those who consider themselves to be lords, once they realize your such supremacy, will surrender unto you – but that is nothing unusual [nor it will add any new glories to you]. Explaining these, AzhwAr explains the intrinsic nature of such servitude towards ISwara who is the lord of all. 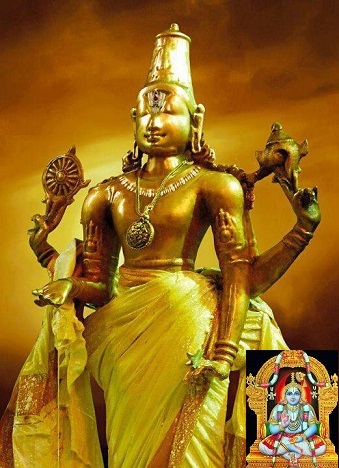 In the previous decad, AzhwAr explained that there is no ignorance in the auspicious qualities of bhagavAn as said in thiruvAimozhi 2.10.11 “poruL enRu ivvulagam padaiththavan pugazhmEl maruLil vaNkurugUr vaN SatakOpan“; here, in this decad, AzhwAr says that there is an ignorance [about the various beautiful aspects of bhagavAn] in the matters of such bhagavAn who is filled with auspicious qualities. The reason for ignorance identified previously is karma [ones own virtues/vices in material realm]. But the ignorance here is due to greatness of bhagavAn. Even nithysUris have this type of doubts. Since this doubt is fitting with the true nature of the jIvAthmA, this will remain as long as the jIvAthmA exists. AzhwAr, while enjoying thirumalai, as mentioned in periya thirumozhi 7.10.3 “vadamAmalai uchchi” (the top of the great northern mountain), experienced the divine beauty of azhagar emperumAn who looks like a part of the divine hill, like a kalpaka tree which has many many branches; AzhwAr becomes delighted thinking about bhagavAn who cannot be seen by the self-effort of vEdham, vaidhika purushas [sages such as vyAsa et al], brahmA, rudhra et al, but can be seen by everyone irrespective of their birth, activity etc when shown by bhagavAn himself. This entry was posted in thiruvAimozhi, thiruvAimozhi 3rd centum on July 5, 2016 by Sarathy Thothathri.